Trading 212 is a London fintech company that offers democratized access to the financial markets with free, smart and easy to use apps. Investors that chose Trading 212 enabled to trade equities, currencies, commodities, stocks, indices and cryptocurrencies. The broker is known for their first and only zero-commission stock trading service in the UK and Europe, which unlock the stock market for millions of people to trade. The company established in 2006 headquarters in the UK, however, serves office in Bulgaria, as well operates through direct service lines in numerous worldwide countries like Argentina, Chile, Mexico, China, Russia, Italy, Poland, Spain, Germany and more. Another progressive feature from Trading 212 is the mobile app that has more than 14 million downloads, that made it one of the most popular trading apps in the world with its numerous awards for excellence. Trading 212 places significant importance on the performance of execution on high speeds on all Clients’ orders, within the limitations of technology and communications links. Execution Venues or the entities with which the orders are placed and executed are connected through the Trading 212 technology to the most significant liquidity providers. While for the purpose of order execution for CFDs, the Company acts as principal, which means that Trading 212 operated through a STP execution model. Is Trading 212 safe or a scam? Trading 212 is a trading name used by the Trading 212 UK Ltd. and Trading 212 Ltd, which are respectively registered in the UK and authorized by the Financial Conduct Authority. In parallel, Trading 212 Ltd. is registered in Bulgaria and regulated by the Financial Supervision Commission. So why is the regulation status so important? Because it means that you, as a trader, ensured of an implemented safety measures, as well that the broker is checked on a regular basis by some of the sharpest authorities in the industry. According to these regulations, client’s funds are compliant to regulations and are kept separately in segregated bank accounts. Meanwhile, the Financial Services Compensation Scheme (FSCS) and the Investors Compensation Fund (ICF) in Bulgaria cover client’s funds in the unlikely event of Trading 212 default. Means every trader will be compensated if the company fails and eligible to get compensation up to GBP 50 000 through UK entity and the ICF Bulgaria compensation up to EUR 20 000. As we see that Trading 212 caters to suit traders need with most convenient technology, the broker has chosen to offer a single proprietary platform. The platform provides a trading full variety of proposed instruments with an easy, user-friendly interface. There is no need to download the program since trader can get access through any computer browser. 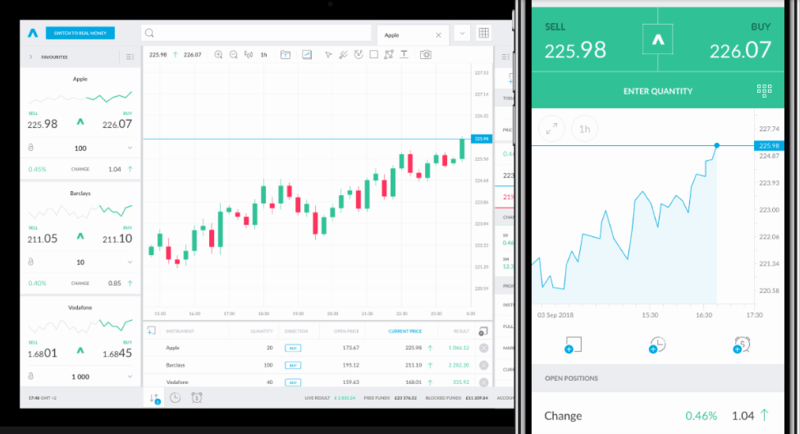 The platform developed with the purpose to make the trading process smooth, nevertheless featuring all necessary tools for analysis, viewing, charting, as well enhanced by a built-in economic calendar and real-time news feed. Another great feature from the company is their trading applications that bring the freedom to trade anywhere. Free and simple to use apps suitable for iPhone and Android devices. Apps feature the same experience as desktop version but with more comfort, while being nominated as the best mobile app in the UK because of their emphasis on intuitive design. To simplify the choices, the broker provides its clients with only one account type for live trading. Further on, according to the trader’s activity, trading volumes and initial capital the offering may vary and offer more competitive conditions, along with tailor-measured solutions. Definitely, to get knowledge is one of the crucial parts in online trading, hence to get advanced education and practice trading with a test of the strategies is crucial for a successful start. Therefore, Trading 212 Demo account offering $10,000 in virtual funds allows trading without risk and time limitation, as well as comprehensive educational material webinars and supporting sources give you all necessary information to analyze markets. Being an STP broker the Trading 212 fees considered to be on a very competitive level and offering some of the tightest spreads in industry. The broker offers a range of markets while all trading instruments are commission free through CFDs and Forex trade, as well trading through Equities. The Trading 212 Spread offers both fixed or floating spreads, however, zero spread trading enabled by Trading 212 on selected currency pairs from one account per client. The Cryptocurrencies are traded 24/7 and offering Bitcoin, Ethereum, Litecoin, Ripple and more speculation though floating spread with the margin of 10% and Spread of around 55. Check out details through an official website. – Commodities brought to the trader with fixed or floating spreads too (the Gas spread from USD 0.03), starting from the minimum quantity of 1 and margins from 0.5%. A SWAP or overnight fee, which is usually charged once a position opened longer than a day calculated as per the particular instrument too. As an example for EUR/USD short position swap fee is 0.000002, while the long one will be an additional small gain to you trade, which is typical -0.000151. For instance, check out and compare Trading 212 fees with its peer XM.com. Leverage, known as a loan given by the broker to the trader enables trading with a larger size than the initial invested capital is. The leverage significantly increases the potential of gains, yet works in reverse too, that’s why you should you leverage smartly. The recent regulatory updates from the European regulators and ESMA regime itself mandated EU brokers to set a maximum leverage level to 1:30 with a purpose to protect clients. Trading 212 offers several, the most common ways of depositing money into trading account: Credit and Debit Card, Wire Transfer, as well e-payment Skrill, Dotpay, Giropay, SafetyPay, Carte Bleue, Mister Cash, Direct eBanking, CashU and UnionPay. Depending on the method of payment and the currency of your trading account, there is a deposit fee between 0.7% and 3.5% is applied. 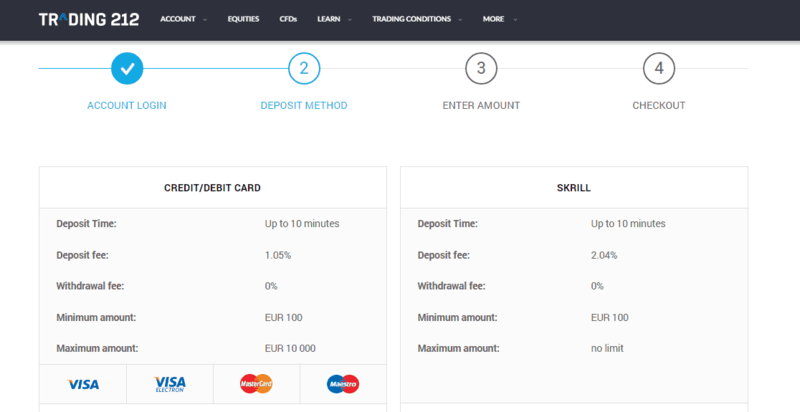 To open an account with Trading 212 the minimum deposit amount to start trading requires either GBP 100, EUR 100 or USD 150. The withdrawals are typically processed by the same method as the deposit was done, while Trading 212 withdrawal fee is 0%. Means there is no any charges for withdrawal, yet the transfer via Bank wire or Skrill eligible to the bank/Skrill fees requested by the service provider itself. The Trading 212 broker is among the shortlisted companies that offer zero-commission and bringing access to trade the stock market for many traders. In addition, Trading 212 acting as an agent hence offering some of the tightest spread in the industry. Overall, Trading 212 is easy to use, yet a powerful trading solution, which is perfect for both beginning traders with benefits through excellent learning material and support provided by the company. Veteran traders will have their advantages too, along with competitive conditions, powerful technical trading side and again with a great multilingual, easy to reach company support.